This comforter is true to color. Looks fabulous. I do not regret this purchase at will. I would purchase again. Create a trendy and contemporary bedroom with this comforter set. This modern collection features a paisley patterninside an ogee design for a unique look. The soft grey works as theperfect backdrop for the bright orange and neutral khaki printed onthis 220-thread count cotton sateen fabrication. Two euro shamsfeature the bright orange color from the top of bed with whiteembroidery while 2 decorative pillows feature beading andembroidery details to pull this look together. While the comforter was long enough, it was very stingy on width. I would not buy again. Love the set! Fabric, design and pillow shams all exceed expectations. The colors are beautiful. The solid color at the bottom of comforter is more grey, no hue to blue/grey. The quality is great and materials are very soft. Love this set! The colors are vibrant, and bring up the mood in any room. Material quality is much better than I had thought it would be for the price. Wish it had come with sheets, but with such a wide color palette in the pattern, it was easy to match. I would definitely recommend this set. With the standard and Euro shams included, I really did get the biggest bang for my buck. I puchased the full/queen for a full-sized bed. I think I still need to purchase a coordinating bed skirt to cover the box springs and frame but I do love the bright colors. I was expecting a little more rust instead of bright orange, but overall I am pleased with the purchase. Great vibrant colors just as pictured! Great bedding set. Very nice colors and love the shams and decorative pillows. I wish the fabric was softer though....kinda rough feeling. The comforter is a little on the lighter side too. Overall I am happy with it. Great vibrant colors, and all the pillow accessories you need to finish the look in one purchase. Every time someone comes over I get compliments on the bed. It's modern but classic. I never had a bedding set with a pattern, yet a happy bold one. I love it. Returned the Duvet set to get this! Love it! So colorful! Not on the bed yet. I am waiting until I paint the bedroom. Will complete the new look perfectly. 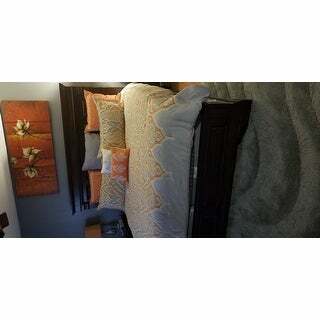 Th comforter set is beautiful the colors are the same as shown. I purchased the orange set and I also purchased orange sheets to go with it. I am so very, very pleased. I would highly recommend it. The set is beautiful, however the orange tone in the pics are muted. The actual color is primary shade of orange- bright tangerine. comforter seems to be not too heavy, but I believe it will keep me warm; but not hot. I absolutely love my new comforter set. Exactly as pictured and the fabric feels so soft. A must buy. Happy with the queen size! reek of mildew odor, poor color and poor quality then to add insult to that you have your nerve to charge me again to ship this mess back to you. overstock should be ashamed. thumbs down overstock I shared this purchase w/ some of my friends and they were more critical than I am. and then I attempt to submit this review w/o any stars and what pop's up? you must click on at least one star. WHY! IF I COULD I WOULD ERASE THE STAR OUTLINES.. This set did not meet my expectations. Fabric was not the greatest. Colors were not as vibrant as shown. Also the design was kind of busy. Would look okay in a large bedroom not average room. "Any curtains to go with it? Any recommendations?" "Are the decorative Orange and white pillows in the background available ? If so is there an item # ?" "How would you describe the feel of the fabric? Would it feel nice to sleep under? One person described it as scratchy?" nice and soft, I love it. I like the colors and it is very soft. I have another one in a different color at another house and I like it very much.